TV allure such as Mouni Roy, Hina Khan, Drashti Dhami, Tejasswi Prakash, Anita Hassanandani, Karishma Tanna stole the show on the red carpet. Additionally, fab performances from Shakti Arora-Helly Shah, Karan Tacker, Drashti Dhami, Divyanka Tripathi-Karan Patel place the stage on fire. Among Those Esteemed awards of Indian Television Industry, Gold Awards 2018 Service has Been held in Film City, Mumbai. At this ceremony, several TV celebs created their glamorous appearances. 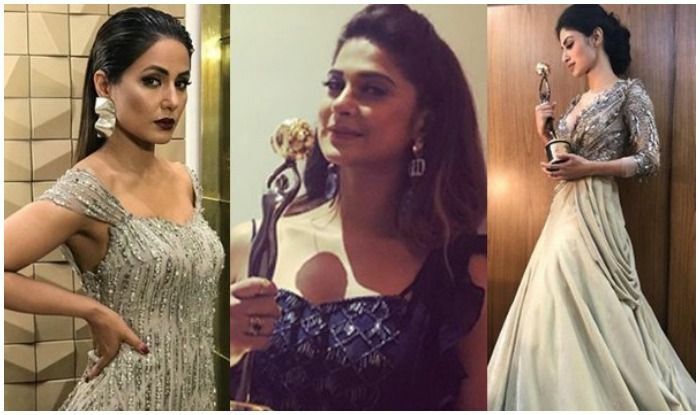 As we all know Hina khan is famous for her style and stunning outfits.Big boss celebrity is in lime light from the big boss season for her unique and different looks.In Zee gold awards Hina khan donned a adorned outfit by Actual Heritage that had a brief feathered train. Gelled back hair dark lips, dangler rings finished her off appearance.She was looking stunning in the event. “Going for Gold this time at the @goldawardstv and this one’s for the entire team at Bepannaah for their collective effort – fantastic writers, an incredible camera crew, the best co-actors and a supporting cast of critics and constants – my family, friends and fans who have more faith in me than I have in myself sometimes. What a reminder to tell you that hard work is truly rewarded and reassurance that atleast, I’m on the right path!,” wrote the actor. Nia sharma is at the top among the all style divas.Nia is also listed as most sexiest Asian women.In gold award 2018 Nia choose to wear a white color dress with a diffrent look.Even she used white liner to match with the dress idea.She posted her pics and write a note about her look. “Girls! I don’t know about you but I put on a dress and makeup after a month today! Lemme feel pretty 😊🎉xoxo #goldawards2018,” read the photo caption. She always give us fashion goals with her new look and unique idea.She choose to wear a long satin gown for the gala night. Mouni Roy was among the winners at Gold Awards 2018. Drashti appeared absolutely ravishing because she wore a one-piece white flared jumpsuit. We particularly love her makeup and hair, which makes it one of their favorite looks from previous night. .